The Sikh Times - Biographies - Chirinjeev Kathuria: "If You Fail, Learn From It"
Chirinjeev Kathuria: "If You Fail, Learn From It"
35-year-old Chicago-based doctor, Chirinjeev Singh Kathuria, gave up medicine to pursue business ventures in telecommunications. Kathuria, telecom baron Walt Anderson and other businesspeople invested more than $30 million in MirCorp to commercialize space. Their plan was to use the Mir space station but it was de-orbited last month by Russia since it was old and expensive. But Kathuria and his associates fought for their dream. MirCorp's first customer, California-based investment counselor Dennis Tito will travel on a Soyuz spacecraft this Saturday. Kathuria earned Bachelor of Science and Doctorate of Medicine degrees from Brown University and an M.B.A. from Stanford. "On Sunday, Dr. Chirinjeev Kathuria became the second businessman to announce his candidacy for the G.O.P. nomination to fill U.S. Senator Peter Fitzgerald's soon-to-be open seat in 2004. Following investor-turned-high school teacher Jack Ryan's announcement two weeks ago, Dr. Kathuria is the second to officially announce, choosing the backdrop of IllinoisLeader.com's first anniversary celebration as the occasion to declare. 'I am here to announce that I will be on the Mar. 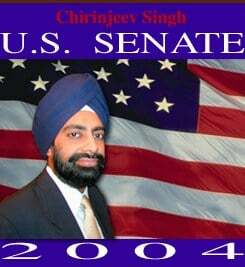 16, 2004, Republican ballot for U.S. Senate,' Kathuria said." "Kathuria, perhaps the wealthiest of all persons who have announced an interest in running for U.S. Senate, told the crowd that he admired the entrepeneurial spirit of the founders of IllinoisLeader.com. The multi-company founder said that the free market system in America has given him the opportunity to become a successful businessman. 'I want to give back now,' he said. Dr. Kathuria declared to the crowd that he supported a 'personal protection law,' for the carrying of firearms in Illinois 'by law-abiding, trained citizens.' "
"Kathuria, a practicing Sikh, openly acknowledges to the crowd his 'unique appearance,' putting the crowd at ease with him immediately. Sikhs do not cut their hair or beards and wear a turban as a symbolic 'crown of spirituality.' Kathuria made his first appearance at the Chicago Conservative Conference in Mar., when he surprised many conservatives with his pro-business, pro-free market remarks. The market value of the companies Dr. Kathuria co-founded and help build reaches reportedly the $1 billion mark." "Kathuria, 38, was born in New Delhi, India, brought to the U.S. at the age of eight months and grew up in Chicago. His mother was a doctor and his father an engineer. Kathuria earned a bachelor's degree in science and a medical degree from Brown University, and went on to receive an M.B.A. and a Master's in public management from Stanford. He combines his knowledge of medicine with computer technology in the company called HealthCite, Inc., which serves as a single point of online contact among customers, physicians, retailers, vendors, pharmacy companies, and suppliers." "A company description says that HealthCite sprang from focus group discussions among doctors and patients. Whereas doctors were concerned with maintaining the confidentiality of patient records, patients identified the need for information presented in laymen's terms. HealthCite has formed a strategic alliance with biotechnology company Amgen involving software, technology and Web development. Kathuria is the chairman of Vimani Wireless, Inc., a wireless service provider based in Chicago. Vimani's services include deployment, installation, W.L.A.N. software, network management and remote monitoring, and enablement of broadband services to provide wireless broadband services." "Katuria also founded New World Telecom, L.L.C., a company that develops and operates telecommunications and Internet projects throughout the world. Medical Oasis, Inc. was co-founded by The Kathuria Group and is positioned to become the premier chain of diagnostic imaging centers in the nation. 'The company was formed,' Kathuria says, 'to provide medical providers (physicians & hospitals) with the opportunity to enhance their patients' satisfaction, services and revenues by adding diagnostic imaging as well as screening services to their existing medical practices.' The company has negotiated favorable equipment vendor financing agreement for $100 million with Banco Popular that allows the company to build, develop and manage approximately 50 diagnostic imaging centers." "At one time, Kathuria applied to be an astronaut, but was rejected by N.A.S.A. He now wants to make the outer space a tourist destination, and another company he runs, MirCorp, is a part of that dream. Currently, a trip to outer space costs $20 million per person, which includes training and the mission, making an outer space tour cost prohibitive except for the eccentric elite. 'I cannot afford it yet. I'm waiting for the cost to come down to $1 million,' says Kathuria. Dr. Kathuria was instrumental in helping build MirCorp. On Apr. 4, 2000, MirCorp became the world's first company to privately launch and fund manned space programs. MirCorp sent the first 'citizen explorer,' Dennis Tito, to space, and is now building the world's first private space station. MirCorp is a joint venture between Rocket & Science Corporation (R.S.C.) Energia and Gold & Appel." "Kathuria co-founded Ushafone, a mobile telephone services company licensed to serve a full one-third of India's population. X-Stream Networks, Inc. was co-founded by Dr. Kathuria and pioneered the free I.S.P. concept. X-Stream Network, Inc. was one of the fastest-growing Internet service providers (I.S.P.) in the world and became the third largest I.S.P. in the United Kingdom. The X-Stream Networks, Inc. merged with Liberty Surf and went public on the Paris Stock Exchange for U.S.D. 2.9 billion in Mar. 2000. LiveDoor Inc. is a large Japanese I.S.P. that he co-founded." "In a 2001 online chat found at www.rediff.com, Kathuria told the participants that his hobby was 'looking for a wife.' He went on to say, 'Maybe I should spend one-third of my day focusing on this as opposed to building new companies.' When asked by a chat room member what he saw as the key to success, Kathuria said, 'I think it is being happy, and if you fail, learn from it.' He went on to explain his thoughts by quoting an old Chinese proverb, 'Our greatest glory lies not in never falling, but rising everytime we fall.' "
"The Illinois Republican party will see how determined this candidate is within the next few months. If he is as serious about the candidacy as he is in building companies, analysts speculate this could be one of the most interesting political seasons in recent history."